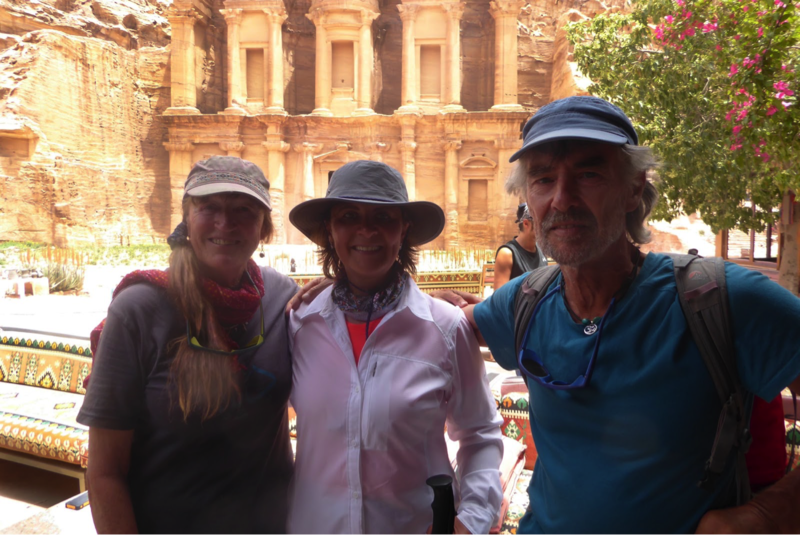 We had the idea of the Jordan Trail back in the late 1990s when we were exploring Jordan for our guide to Jordan’s ‘Walks, Treks, Caves, Climbs and Canyons.’ It had become obvious that some of the treks could form the basis for a country length trail. Over the following years, we continued to add to it whenever an opportunity arose during our annual springtime visits. 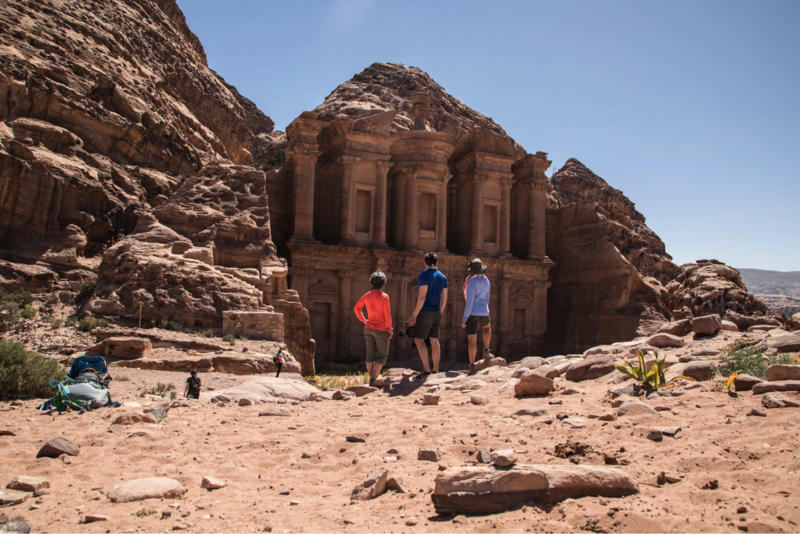 Following the publication of our guidebook in 1999, rapidly increasing numbers of young Jordanians also began to discover the wonderful variety of adventures that their country has, and they too began trekking, canyoning and climbing. In 2016, we finally reached the Red Sea. 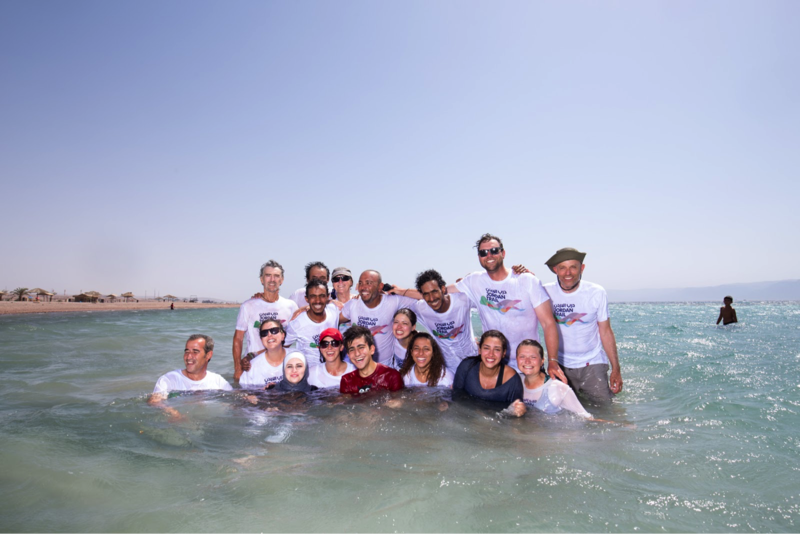 Next spring, the trail’s official Inaugural Thru-Trek was made, a happy and optimistic multinational group being waived off from the Greco-Roman site of Um Qais by Jordan’s Tourism Minister, Lina Annab, and other well-wishers. North Jordan in spring is a beautiful region of flower-filled meadows, forests of Mediterranean oak and Strawberry trees, orchards and olive groves, quite unlike most people’s concept of Jordan as a ‘desert country.’ Trekking there is, for the most part, easy, often on established paths or country lanes across rolling hills. The views west across the sub-sea level verdant Jordan Valley to the distant hills of Palestine are unique often with splendid sunsets. Some nights are camping with catering by local people who, throughout Jordan are always welcoming, others are in village homestays. Whatever the location, the mouth-watering array of local food is always irresistible, perhaps too much so! 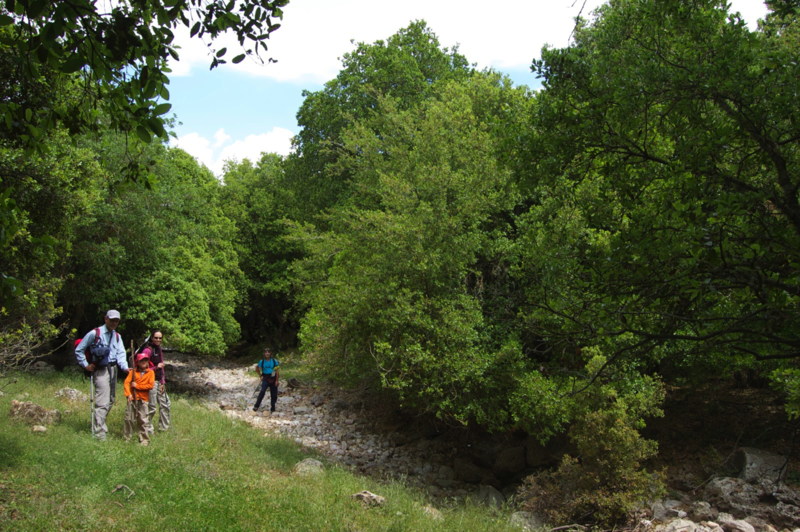 Trekking up from Greco-Roman Pella and through the rural villages of Al Ayoun, the next stop are the ruins of the Byzantine church of Mar Elias only discovered in 1999. Beyond, Ajloun Castle built by Saladin’s nephew in the twelfth century is located on the North’s highest top at 1000m and well worth a visit to appreciate both its impressive construction and the superlative views. The way on then winds its way through forested hills to a homestay in a small charcoal burning community before crossing the wall of the King Talal Dam to camp in a beautiful location high above in the hills. Heading south again still in high limestone hills amongst pine trees and olive groves, the next night is in the village of Rmeimeen where the church spire and minaret rise together from the trees, both welcoming visitors. Next is the Christian village of Fuheis, home of the Caracal Brewery providing an opportunity for additional refreshment. Next, beyond more hills, the ruins of Iraq el Amir are the location of the welcoming Women’s Cooperative who provide food and home for the night. 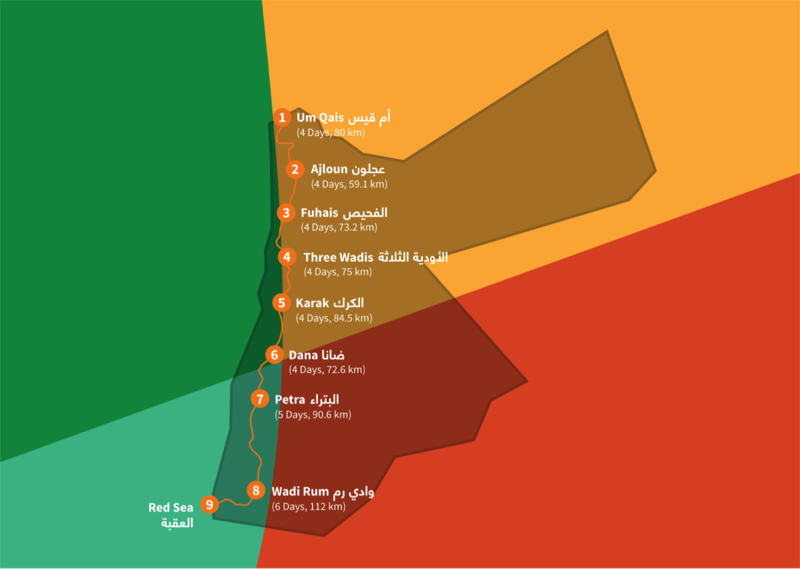 The route then crosses more hills, now high above the Dead Sea, the lowest point on earth, 430m below sea level. Once again a night is spent in a Christian town, this time Madaba with its mosaic map, one of the oldest in the world depicting Palestine and other major Biblical sites in AD560. The short but steep descent and ascent of yesterday was but a preamble for the following days! The way ahead is now more serious descending a long way to meet an almost forgotten Roman road on a dry and barren plateau above the Dead Sea, home to a few scattered Bedouin camps. Then up again and down into the first of the three 800 meters deep Dead Sea Canyons, still frequently on the Roman road. Even in spring, it’s already getting hot down there, and it’s a long steady climb back up the south side. 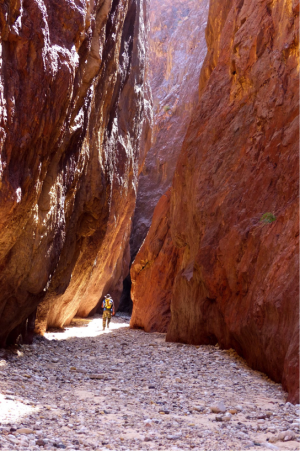 There are still two more canyons to cross, first the Hidan, passing unexpected dolmens probably from the early Neolithic period (4000 to 3000 BC), then the Mujib, Jordan’s answer to the Grand Canyon. On our earlier explorations, we had a chance to camp on the top as if on the prow of a boat. What a spot! As we arrived, the sun was sinking behind the blue-shadowed hills of Palestine lighting the Dead Sea with a golden glow. The lights of Jerusalem were visible in the darkness while below us, the canyon sides turned briefly amber above their black cliff-rimmed lower depths. Then, as we too were swallowed by night, the myriad stars of the clear Jordanian sky came out, their brightness untouched by a slender sickle moon. Later, as we dozed in our sleeping bags, shooting stars swept across the sky. Stirred by a cold morning breeze rising from the sub-sea level depths below us, we woke early to watch the sun rise into a red dawn sky, bringing its welcome warmth. We had wondered if the descent into the Mujib would be possible. 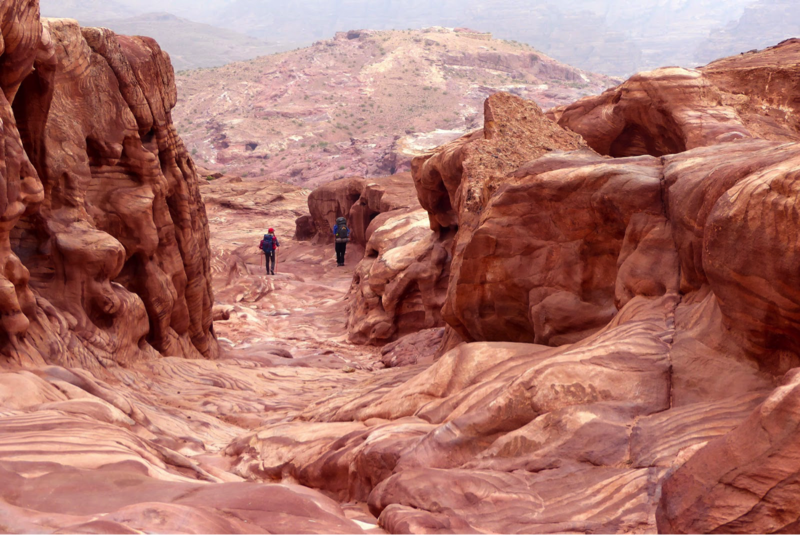 Everywhere we looked it had seemed unlikely until we were shown a Bedouin trail, the key to the canyons. It’s a truly incredible route which the group of thru-hikers enjoyed to the full. In its lower reaches, an ancient path had been constructed across a cliff supported by rocks heaped up from the hillside below, now worn and polished by the passage of Bedouin shepherds and their flocks over millennia. Once down, the river beckoned and we crossed through its cool knee-deep water, finding our way through head-high phragmites reeds while fish swam between our legs. A little further downstream there is a possible campsite and another swimming pool, but the thru-hikers valiantly headed on up to the south rim meeting the vestiges of a Roman road again before camping on the rim of another canyon once again with awe-inspiring sunset views. 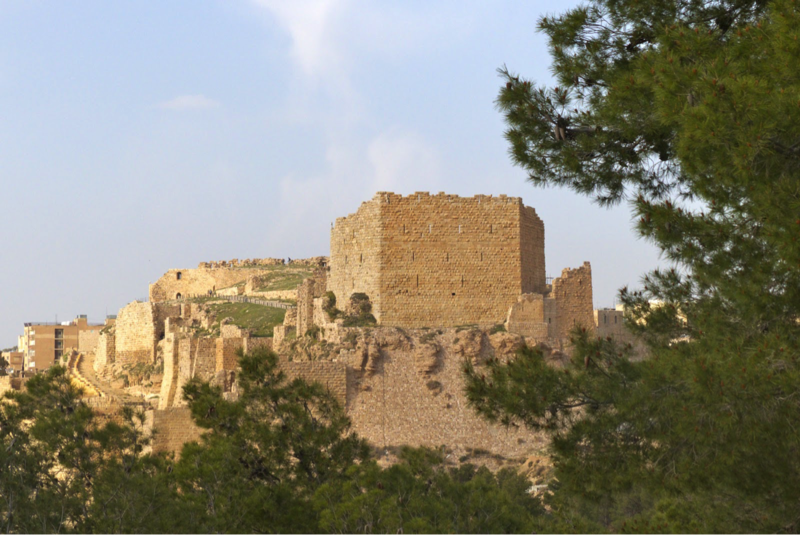 Traversing its rim, we soon came within view of the imposing walls of the great Crusader castle of Karak, where a choice of hotels is available. Continuing south the trail now enters hotter and drier terrain. 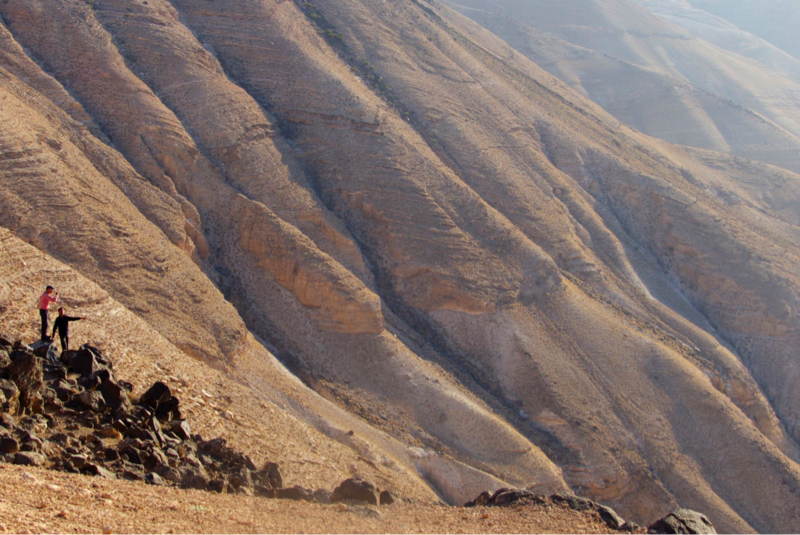 After the almost deserted village of Ainun, rough tracks returned to the escarpment above the south end of the Dead Sea before descending into the 1000 meter abyss of Wadi Hasa. Bathing in its hot spring is tempting, but the equally long ascent back up to the high southern plateau is waiting. Once there, an easier walk reaches the ancient village of Ma’tan, its cliff-top houses now being renovated for visitors. And what an amazing place it is, with its dramatic view into what will be the next day’s big canyon descent and ascent. Once across, the trail then passes the village of Buseira the adjacent Iron Age ruins of Bozrah. 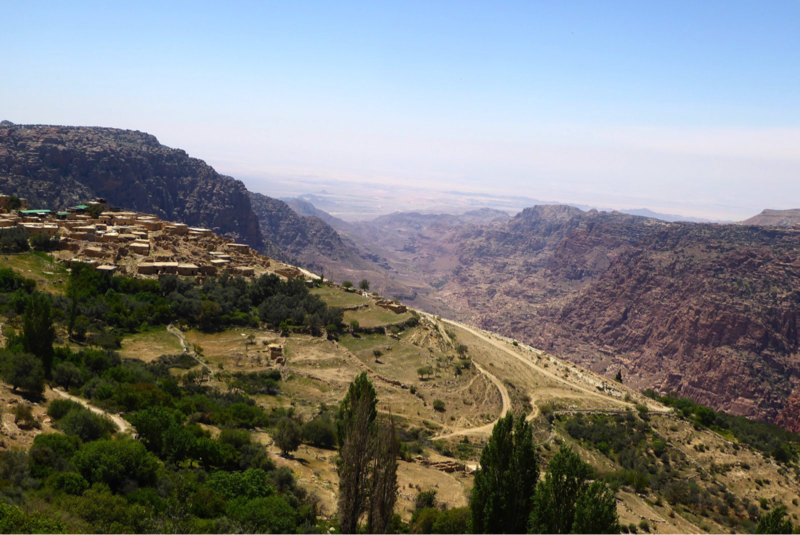 An easier walk then rises to yet another impressive view: bounded by cliffs a deep arrow straight valley cleaves its way down to the hot, hazy sea level depths of Wadi Araba, the southern end of Jordan’s Rift Valley. Not far below this viewpoint, the cliff top village of Dana perches on its eerie and offers a choice of accommodation for the night in renovated Ottoman period houses or a hotel run by Jordan’s Royal Society for the Conservation of Nature (RSCN). Walking down the Dana valley the next day was a pleasure on a good trail with wild scenery all around. As the track enters Wadi Araba, the spoil heaps of Roman copper mines can be seen before the trail reaches Finnan Eco-Lodge, an award-winning hotel in the style of the great mud-brick mosque of Djenne in Mali. It’s tempting to stay overnight, and we recommend it, but with the day little more than half gone, the thru-trekkers chose to continue south across the hot black stone desert of Araba pitching their tents as the sun set. This allowed an early start for the long climb back up into the mountains the next day. 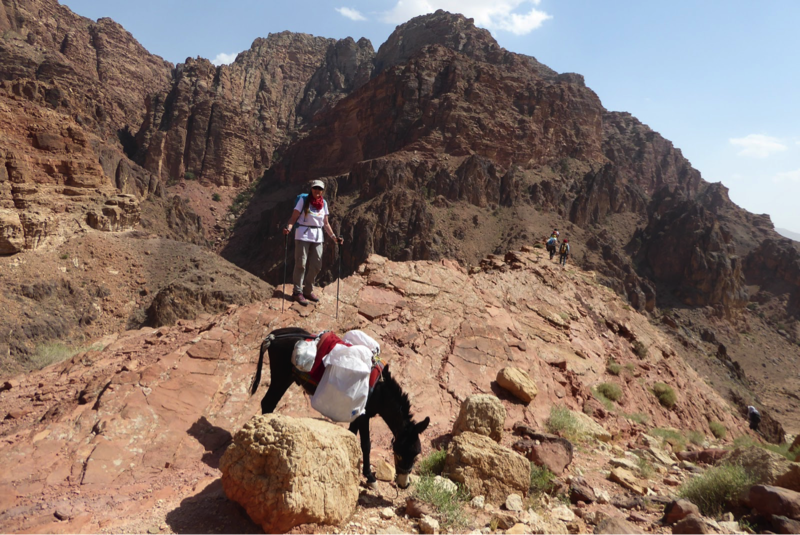 A time-worn Bedouin trail wound up steeply between cliffs and in a dramatic scenery before plunging into the ravine of Wadi Feid where a waterfall and pool offered refreshing relief. Then up again to a high camp, another blood red sunset soon following our arrival. While pitching camp, Tony was bitten by a scorpion. “What color was it?,” our Bedouin guide said. “Yellow,” Tony replied. “They are the worst,” he said, followed by, “What size?” “Only small,” Tony said. “They are the worst,” he said again with a grin. You have to like their sense of humor! Tony was a bit ill all the next day, but okay after that, but we had a beautiful day trekking along a high escarpment with a warm breeze rising from the depths before descending to a tourist camp on the edge of Petra. We entered the ancient city the next day via “the back door.” This old Nabataean trail had been a narrow path across cliffs seemingly known only to Bedouin when we first walked it in the mid 1990s but had since been ‘manicured’ by the Petra Park Authority into a wide, safe, wall-edged trail, losing its history but enabling it to be promoted as an alternative entrance to the famous Petra Siq. The first glimpse of the mountain-top Monastery is as surprising as the first view of The Treasury from the Siq, though we avoided that on the way out from this most impressive of ancient cities. Instead, we exited through a tunnel carved through the mountains by the Nabataeans to divert flood water away from the Siq, the main thoroughfare in ancient times as well as today. Flash floods are dangerous! We saved the Siq for the next day, setting off early for a long trek, first through Petra again before leaving beyond its Roman theatre to head south beneath Jebel Harun, reputed burial place of Aaron, brother of Moses. A delightful descent of wild and lonely Wadi Sabra followed past the remains of yet another Roman theatre sited on the old Roman way to Petra from the south. Then on and deeper we went into the lonely mountains of Masuda through which the trek winds its way on Bedouin trails for four days with local guides while the support team ensured that camps and meals were always waiting on arrival as they had at other camps along the route. 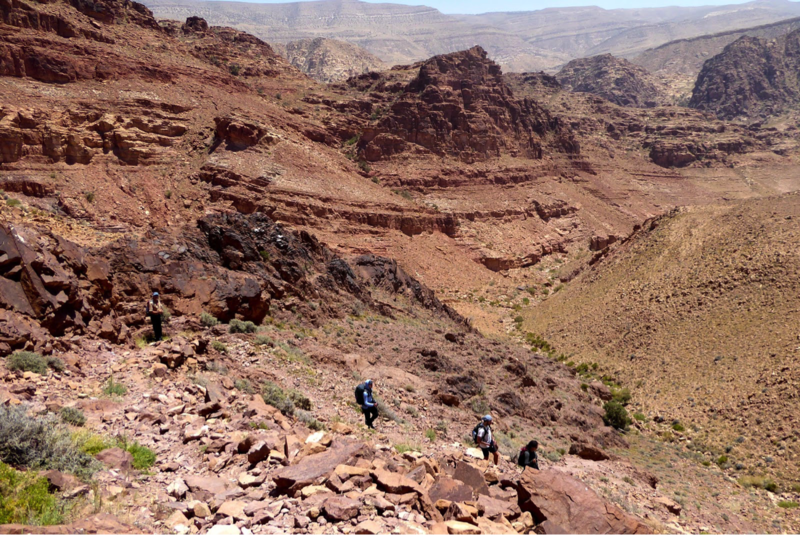 The trek eventually emerged back onto the desert plateau through the almost day-long Aheimir canyon, sometimes only a meter or two wide with high cliffs on either side. On our previous trek through we had to wade a deep pool and climb a tricky boulder-jam at its head. Now all had been swept away by a flash flood, and the canyon was obstacle-free, but beware, it's no place to be on a rainy day! Once out we camped near the ruins of Roman Humeimah. 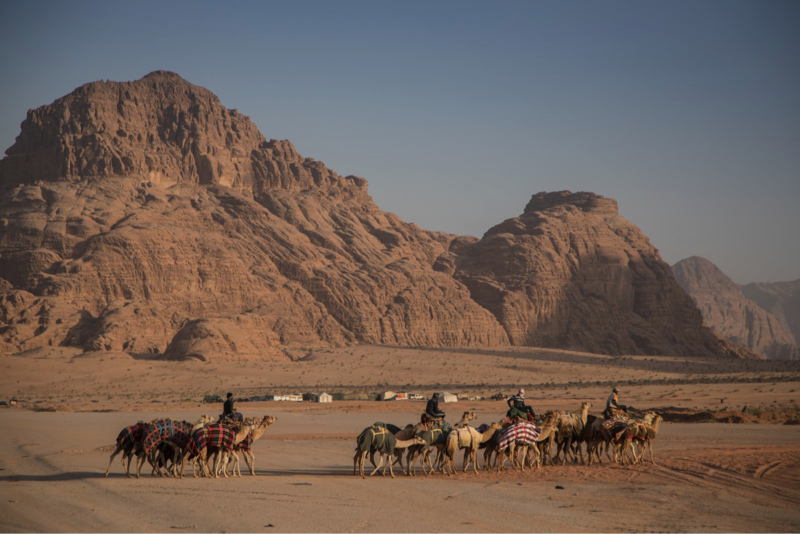 Beyond the desert to the east, the distant skyline was ragged with the mountains of Wadi Rum, made famous by Lawrence of Arabia, and reached by a two-day trek across the sands. We know Rum well, we have visited there every year since 1984, living with the local Zalabieh Bedouin and exploring its mountains for Tony’s guidebook to ‘Treks and Climbs in Wadi Rum’. Lawrence called it “Rum the magnificent... vast, echoing and God-like”. He was right! Beyond, the trek continues still in expansive desert mountain scenery for another day before heading southwest and leaving the contorted red sandstone cliffs for the basalt and granite hills that border the Red Sea. Its distant waters glimpsed from the crest of the hill beneath which we camped on our final night. A long descent and climb took us to the final pass, the Red Sea now beckoning temptingly below. It was early May, and hot, too hot at over forty degrees. We sought shade under trees and rocks as we made our way down a valley of pink granite boulders to the final sandy wadi which took us to the sea. A welcoming band was there to greet us as we ran past and plunged jubilantly into the welcoming waves. To beat the heat, the official 2018 through-hike will start a month earlier than the 2017 trek, on March 1st. Tony began climbing in 1953 becoming an instructor and guide in the 1960s, and making the first ascent of Norway’s Troll Wall, the tallest and steepest North Face in Europe, in 1965 with an English team simultaneous to an ascent by a parallel route by a Norwegian team. He subsequently founded Troll (the leading UK climbing equipment manufacturer), then in the 1980s he and his wife Di Taylor formed n.o.m.a.d.s. (New Opportunities for Mountaineering, Adventure & Desert Sports), an adventure travel consultancy giving them the opportunity to explore new mountain areas. 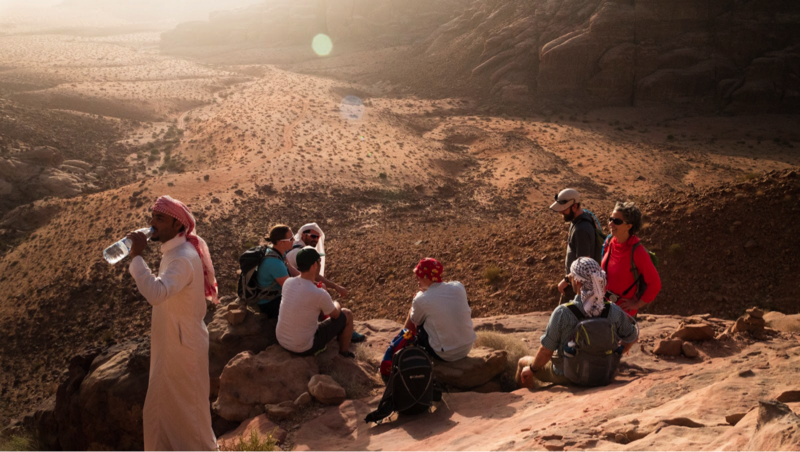 They climb and trek worldwide, and have written or contributed to guides to UK, Norway, Oman, Palestine & Jordan, where, amongst other things, they discovered the climbing and trekking in Wadi Rum and initiated the development of the Jordan Trail in the late 1990s participating in its inaugural through trek in spring 2017.